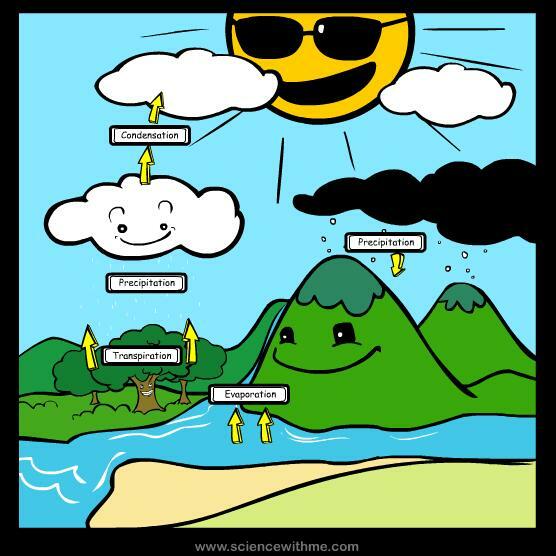 I discussed the effects of climate change on the water cycle in a previous blog (September 3). I focused on the fact that while the water cycle is not a perfect cycle, our planet, whose surface consists of 70% water, cannot experience shortage of water. Instead, I posited, (August 27, September 3, 10 and 24 blogs) the planet experiences severe shortages of fresh water; a problem that is bound to become worse. Fresh water is essential to survival for almost all of the land species on the planet – including humans. This shortage needs to be addressed. Previous blogs have dealt with addressing the shortage through recycling (September 10) and the better management of use (September 24). This blog and a subsequent blog will try to address the issue through increase in supply. It emphasizes the way in which the sun-induced evaporation from the ocean separates fresh water from saltwater. By applying this theory on a larger scale, it becomes apparent that if we want to increase the supply of fresh water we will need to increase this separation in a controlled way and therefore must engage in water desalination. To accomplish that, we need to use energy, which means that the issue of addressing water stress is also inherently tied with the need to transition the energy sources that we use. To start the discussion, we need to have a short look at the science of desalination (Sorry! I know you think Science is boring…). In another previous blog (June 4, 2012) I mentioned thermodynamics without going into details. Thermodynamics is the area of science that describes the relationship between heat, energy and work. Its two basic laws are arguably the most essential tenets upon which the rest of science is built. If someone were able to refute one of these laws in a credible way, much of science would have to be reformulated. (Obviously, scientists take this definition of “credible way” very seriously). One of these laws is equivalent to the law of the conservation of energy and it tells us that energy cannot be created or destroyed but only converted from one form to another (chemical energy of burning a fuel to mechanical energy of the moving car, as an example). The second of these laws tells us that if a system is left on its own, it will tend to maximize its disorder. When I am discussing this topic in a class with students who have no prerequisites in science, I always make the analogy of a small child lucky enough to have a room of its own. Leave him (or her – gender makes no difference here) alone and the room will quickly get messy. His clothes will be everywhere, his toys will be everywhere and so will everything else that he gets his hands on. The state of the room can obviously be fixed – but not without some effort (i.e. work and expenditure of some energy) either by the parents or, after appropriate bribing, by the old enough kid. The physical reason for the “natural” state of the messy room is that there are simply many more ways for each of his items to find their way into a messy configuration rather than an orderly one. This law is also responsible for, among other things, heat’s tendency to move spontaneously upon contact, from hot object to cold object instead of the other way around; and energy costing approximately three times more to deliver from electricity obtained by burning fuel than from directly burning the fuel. Back to desalination – if I take a cup of concentrated salt water and dump it into a container of fresh water, the salt will spread around very quickly through the entire sample, making a larger amount of diluted salt water (you can safely try it). The reverse process will never take place on its own because there will be many more ways to distribute the salt particles in a homogeneous solution than any segregation can provide. If we want to mimic the water cycle by separating the fresh water from the salt water we will have to put energy into the system. Nature does this by using solar energy to evaporate vapor of fresh water from the salty ocean. We can mimic the natural process by simply boiling water and collect the resulting steam. This process is used commercially in some places, but is gradually being replaced by the much more efficient process of Reverse Osmosis. 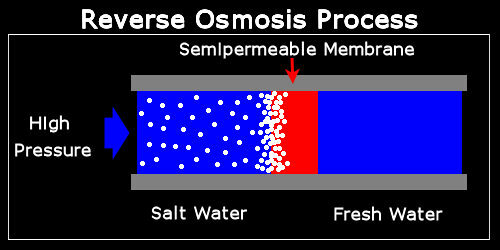 A schematic representation of the Reverse Osmosis process is shown below. The salt water is “simply” being pushed against a semipermeable membrane that allows the pure water to pass through while retaining the salt particles. 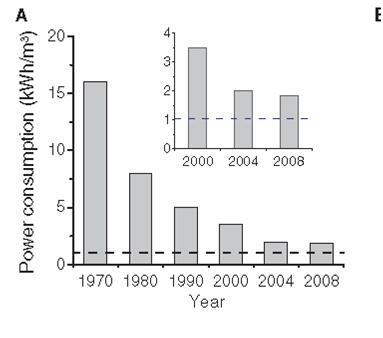 Such an improvement in power consumption gives almost everybody hopes for a practical way to address the global water stress. The next few blogs will explore the ways in which this technology has already penetrated our daily lives, as well as how it will continue to do so in the future, and some of the issues that need to be resolved as we progress further. This entry was posted in Climate Change and tagged Desalination, Energy, Entropy, Evaporation, Fresh Water, Reverse Osmosis, Salt Water, Science, Seawater, Technology, Thermodynamics, Water, Water Cycle, Water Stress. Bookmark the permalink. I have been considering this for some time and claims over whether or not we in the western world are responsible. However when you look back at ancient egypt and stories of the hanging gardens of Babylon etc. it is easy to see that the world has been changing dramatically over time all by itself, long before the industrial revolution took place. I remain unconvinced that we can do much at all to reverse the effects of this ever changing planet. Just want to say your article is as astonishing. The clearness in your post is just nice and i can assume you are an expert on this subject. Well with your permission let me to grab your feed to keep updated with forthcoming post. Thanks a million and please carry on the rewarding work. We are a bunch of volunteers and opening a new scheme in our community. Your web site offered us with helpful information to work on. You have performed a formidable activity and our entire neighborhood will probably be thankful to you.